Hyderabad: Is the legacy of Nandamuri Taraka Rama Rao, better known as NTR, finally waning? The iconic actor founded the Telugu Desam Party (TDP) in 1982 before going on to serve as a three-time chief minister of undivided Andhra Pradesh. He, however, lost control of the TDP in 1995 when son-in-law Chandrababu Naidu engineered an internal coup, not only ousting NTR from the party but also the chief minister’s chair. 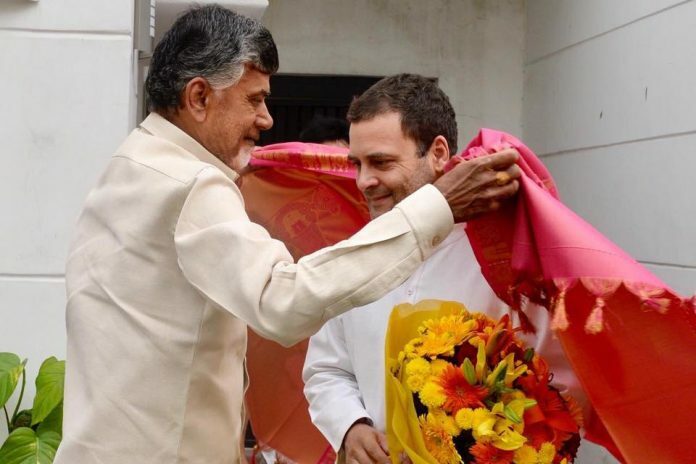 In the over two decades since, Naidu has consolidated his vice-like grip on the TDP, falling out with a number of NTR’s immediate family members, while relegating the others to secondary roles, in the government and the party. Naidu, who is married to Bhuvaneshwari, one of NTR’s younger daughters, has also begun grooming his son, Nara Lokesh, to take over his mantle. A cabinet minister in his father’s government, holding the portfolio of information technology, panchayati raj and rural development, Lokesh looks set to be the torchbearer of TDP’s legacy. Political analysts argue that Naidu has not only pushed NTR’s family to the background, but his TDP bears little resemblance to the party that the Telugu superstar founded and nurtured. For one, Naidu’s alliance with the Congress, as part of the Praja Kutami in Telangana, goes against the very grain of NTR’s ideals — the actor-turned-politician had launched the TDP to break the Congress hegemony in the southern state after the national party refused him a national berth. Naidu’s defining trait, Rao adds, is that he is very industrious. “While one can say that NTR’s popularity lay beyond the party, Naidu is a global thinker, but very party-centric. It is difficult to say that he would be the man who will continue the legacy of NTR as times will change,” the analyst said. NTR’s family, where are they now? NTR had eight sons and four daughters. His sons include Nandamuri Balakrishna, Nandamuri Harikrishna, Nandamuri Jayakrishna, Nandamuri Saikrishna, Nandamuri Ramakrishna Sr, Nandamuri Ramakrishna Jr, Nandamuri Jayashankar Krishna and Nandamuri Mohanakrishna. His daughters are former Congress MP Daggubati Purandeswari, Nara Bhuvaneshwari, who is Naidu’s wife, Uma Maheswari and Garapati Lokeswari. Of the children, Nandamuri Harikrishna, who died in a road accident in August 2018, Nandamuri Saikrishna and Nandamuri Ramakrishna Sr have passed away. It was Harikrishna, along with D. Venkateswara Rao, Purandeswari’s husband, who gave legitimacy to Naidu’s hostile takeover of the TDP in 1995. The two later fell out with Naidu. Before ties turned sour, however, Harikrishna, elected to the Andhra Pradesh Assembly in 1996, was rewarded with the road transport portfolio in the then Chandrababu Naidu government. By 1999, Harikrishna left to form the Anna TDP, which contested assembly elections that year but drew a blank. He returned to the TDP and in 2008, was elected to the Rajya Sabha. Another of NTR’s sons to take to public life was Nandamuri Balakrishna, popularly known as Balayya. For years, Balakrishna campaigned for the TDP, including under NTR. He finally fought an election in 2014 after Andhra Pradesh was bifurcated. He won on a TDP ticket from the Hindupur assembly seat in Anantapur district. Balakrishna continues to support Naidu. His daughter, Nandamuri Brahmani, is married to Lokesh. Among the more successful politicians in the family is NTR’s daughter Daggubati Purandeswari. A two-time Congress MP from Bapatla and Visakhapatnam Lok Sabha constituencies, Purandeswari served as a Union minister in the UPA government. She switched over to the BJP, in protest against the bifurcation of Andhra Pradesh, in 2014. In 2015, she was appointed as the in-charge of the BJP Mahila Morcha. A reason for NTR’s immediate family being left in the political lurch, analysts say, is their inability to match their father’s indomitable persona and mass appeal. Before his foray into politics, NTR was a movie star, among the most revered in south India. He was among the first to exploit his cinematic appeal for political gain, following the blueprint pioneered by the former Tamil Nadu chief minister M.G. Ramachandran or MGR. NTR had always nurtured political ambitions and took the plunge when Congress refused to nominate him as a Rajya Sabha member. He founded the TDP in 1982 and in 1983, defeated the Congress in assembly elections, making him a political force to reckon with. NTR began losing grip of the TDP after he married his second wife Lakshmi Parvathi, some 37 years his junior, in 1993. Naidu played on fears that NTR would bequeath his political legacy to Parvathi, to take control of the party in 1995. NTR died a year later in 1996, but even then he had not lost his standing in Andhra Pradesh politics. He was also then an important player in national politics as the chairman of the National Front (NF), a coalition of political parties led by the Janata Dal that elected V.P. Singh as the prime minister. Political analysts believe that the NTR legacy is so deep-rooted that it will not perish easily. Such is the appeal, says Palwai Raghavendra Reddy, a Hyderabad-based analyst, that Naidu will need support from one direct descendant of NTR to support him. Writer and senior journalist Telkapalli Ravi, who has closely followed the TDP and the NTR lineage, says Naidu himself will do anything to keep the NTR legacy alive. At fading age does It make any difference to present. Day politics?